Home » Blog » How Much is Too Much Debt? 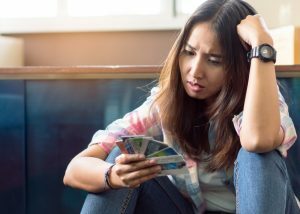 While there’s no magic number as to how much is too much debt, there are many signs that can point out when you’ve crossed a line. If you relate to these signs, you’ve probably got too much debt. Read on to see where you stand. How much more than the minimum payment do you make toward your debt bills each month? Ideally, you’d have no revolving debt outside from your house or car payment. The reality for most of us is that monthly debt payments can really take a bite out of our wallets. If you can’t afford to pay more than the minimum, chances are this is a red flag. Minimum payments keep you in debt longer and end up costing you more in the long run. To get this ratio, divide the amount of debt you pay each month by your total monthly income. If you’re already over 25% approaching 30-40%, you’ve probably got more debt than you can afford, given the cost of monthly living expenses. Debt doesn’t just show up as a number. If you’re feeling stressed out, anxious and tired, debt could be partially to blame. Listen to your body. If this is you, it’s time to take back control over your finances. When you make your payments late, you’re in hot water. Late fees, collections calls and threatening letters — these are the tip of the iceberg. If you’re making late payments because of cash flow problems, take a moment to regroup. How many excess expenses are currently skewing your budget? Do you have $1000 for emergencies? How about a fully funded 3-6 month emergency fund? If not, now is the time to start saving. Getting even a small emergency fund set aside will help. Have you recently been denied credit based on your application? Creditors are hungry to make money, so if they are unwilling to offer you another line of credit or credit card, they believe you’re already in debt to the point where you wouldn’t be able to pay them back. This is not a good sign. If you’ve responded to these tips and feel you’re in over your head, you’re not alone. At CreditGUARD, we’ve helped thousands like you—behind on credit card payments, struggling to make ends meet. There’s good news. Our non profit programs that include credit counseling, debt management and debt consolidation don’t involve any new loans. Call us today at 1-800-500-6489 to learn more about how CreditGUARD can help.